So we have a 14 GT and with the exception of the front seat comfort (bad), we dig the car. I looked forward to swapping it with the new turbo next year so I drove the cx9 signature. Now I understand the 9 is heavier but the new turbo is a real pig. I read sketchy reviews of the new cx5 turbo being unexciting and I concur. I’ll be looking at the new Q3 (228hp/258tq) instead for a few grand more. With a JB4 piggy back, it should be very GTI like (good). Lol, I think people are expecting for the turbo to blow the doors off things. But I don't imagine it will at all, I mean it's a crossover we all drive not a miata. It's too heavy for a 4 cylinder turbo to smoke tires off the line with it. And it seems like Mazda builds them for fuel economy not for smoking tires. I do think the turbo will make the CX-5 a much more viable option for towing a travel trailer, since turbos drastically boost torque. But as far as speed is concerned, well I just don't see much breakaway speed will be added. If you were considering upgrading to a CX-5 Turbo, then why not wait until you can test drive a CX-5 Turbo before judging and deciding you're disappointed? It's amazing how disappointed people all are in something that doesn't even exist yet. The CX-9 is over 600 lbs heavier than the 2019 Audi Q3 and is a 7 seat SUV for $40K. The Q3 is even lighter than the CX-5 (by 100lbs). ps. OP, why not provide some more detail of why you are disappointed in the 2.5T? Just saying it is a pig, does not really say anything constructive. Last edited by dougal; 11-06-2018 at 01:48 PM. There are already test drive reviews of the 2019 CX-5 turbo? The turbo in the Mazda 6 is pretty slow compared to the class. A 2.0 Accord is significantly faster despite being down 1/2 a liter in displacement (5.7 compared to 6.4). The Accord Hybrid is even pretty close at 6.7 seconds 0-60. It will be an improvement over the NA 2.5, but it won't set anything on fire, and with it being on the top two trims only that are $35k USD and up I don't think the take rate will be very high. At that price your are closing in on an RDX which I would take over the CX-5. I recently drove a 2018 CX-9 GT for three days. There was definitely a little more low-end power and getting going from a dead stop or very low speed was easier. But I wouldn't say it was dramatic. The engine was just a bit "rougher", like I could hear/feel it more than in my CX-5, but it was subtle. I appreciated how familiar everything was between the two cars. But my lasting impression was that the CX-9 was too big, in overall size and in relation to the engine, whereas the CX-5 is just right (for me). Then again it might be totally fine for someone who did not already own a CX-5. I drove vehicles with V6 engines and 3-speed transmissions for 20 years before getting my CX-5 so to me the CX-9 would feel better with a V6. Hey, I love Mazda, more importantly my wife loves her CX5. 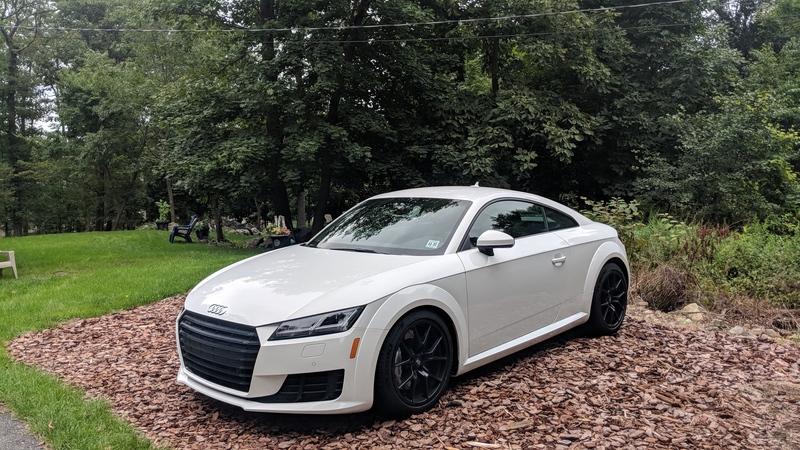 I daily drive a 17 TT with a DSG transmission and the GTI engine. I mention this because I clearly understand what I need out of a small turbo 4. Where these small 4 cyl turbos fail is waiting for the turbo to spool on a track mid corner exit. Where these turbos are GREAT FUN on the street is when you keep it in boost and hammer launches. The 9 is tuned for grandmas, it should be a recipe for great street fun but is neutered into smooth delivery. I get why they did it and I absolutely hate it. The numbers don*t mean anything to me. How the turbo does it*s thing is what is important. GT is the best selling trim in the US. I think it’ll sell just fine, regardless of performance. $35k yes, $38k, I doubt it. I’ve read $35,865 for GT reserve (including delivery). We’ll see. Hope the new Q3 fills your boots. Spend more to get what you want, nothing wrong with that. With that said, since you mentioned a JB4 piggyback with the Q3, would you have considered the CX-5 with an aftermarket tune? GT is the best selling trim in the US. I think it*ll sell just fine, regardless of performance. GT is a great deal actually at right around $30k since that's where a lot of mid level trims of the CR-V and Rav4 are (EX-L and XLE), it's not surprising that the take rate for GT's is high. However the new engine is only on the Reserve and Signature Trims (which force you into AWD). The price jump to a Reserve is $4,825 for the FWD GT and $3,425 for AWD GT. That's a pretty steep increase for the average person for a marginal increase in performance. If the engine came standard on the regular GT like in the Mazda6 then yes, I think it would sell well. I think the average person who doesn't really care about performance won't pony up the extra money for a marginal increase in performance when they can get the features they want on the regular GT. So we have a 14 GT and with the exception of the front seat comfort (bad), we dig the car. I looked forward to swapping it with the new turbo next year so I drove the cx9 signature. Now I understand the 9 is heavier but the new turbo is a real pig. I read sketchy reviews of the new cx5 turbo being unexciting and I concur. I*ll be looking at the new Q3 (228hp/258tq) instead for a few grand more. With a JB4 piggy back, it should be very GTI like (good). It has been awhile since I read new reviews, but all performance stats on the 2016+ CX-9 with the 2.5T turbo were the same if not a tiny bit better or slower than a 2016 CX-5 FWD. So I am really not surprised that you didn't find it significantly better in the performance deparment, to a CX-5. As others have said, it is best to wait and test drive the real thing. Dynomax super turbo on a 5 ?